Created with ‘Max Life’ fabric allows this costume to have enhanced durability! Resistance against light abrasions alongside being UV resistant. 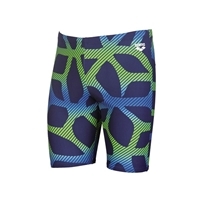 Comfortable material and offers high levels of movement when in the water. Front lined to provide good coverage. The Serigraphy jammers of the One Technology collection belong to the new series of training costumes made with an innovative manufacturing process. A single piece of fabric with an ingenious cut is joined by a single glued seam positioned on the back, which increases freedom of movement, speed and comfort in the water. This masculine costume is decorated along the sides with curved colored lines and on the back with a trendy motif reproducing the Arena logo.